Q: We rent a single-family home and have put a trampoline in the backyard for our kids to use. Our landlord, who is generally a reasonable man, told us to get rid of it, that it’s too dangerous. I can understand not letting us install something, but this structure is portable and doesn’t affect his property at all. If we supervise our kids’ use of it, isn’t it our problem if one of them gets hurt? –James V. A: The way you’ve begun to answer your own question illustrates that there are two legal issues going on here. You’ve correctly analyzed one of them, but not the other. Here’s where you’re correct: Your trampoline doesn’t physically affect or change the property. Unlike, say, a basketball hoop on a pole that’s cemented into the ground, the trampoline can be placed and removed without disturbing the landlord’s property. For this reason, tenants normally don’t need permission to place portable items like this on the property. In contrast, the cemented basketball hoop would be, legally speaking, an “alteration,” which you’d need permission to install. If you installed it without permission, your landlord could require you to remove it (assuming your lease has a “no alterations without consent” clause) and could terminate your tenancy if you refused. To add insult to injury, the landlord could also insist that you leave such a basketball hoop in place at the end of your tenancy, because anything that is affixed to the rental property becomes the property of the landlord, unless the landlord has agreed otherwise. Because your trampoline doesn’t invade the property, however, it doesn’t qualify as an alteration. But that’s not the end of the matter. Unlike other types of portable items, such as patio furniture or potted plants, a trampoline can be dangerous. A landlord generally has a duty to keep the property reasonably safe for tenants, their guests and any other legitimate visitor (as well as any pint-sized curious visitors, too — more on that below). This is why the landlord must fix loose stairs, make sure vents work properly, keep the electrical system safe, and so on. You cannot absolve the landlord of these duties — in legalese, you cannot waive your right to a reasonably safe place to live. For instance, you can’t say, “No thanks,” when the landlord insists on replacing that funky, retro wood stove with vents that are prone to clogging (risking carbon monoxide buildup), no matter how inconvenient or disappointing it might be to lose that stove. Nor can you say that you’ll keep it and take your lumps if and when the stove causes a problem. A trampoline, though not primarily an instrument of danger, is nonetheless a very dangerous toy. As far back as 1999 (and reaffirmed in 2006), the American Academy of Pediatrics recommended that trampolines never be used at home, in routine physical education classes, or in outdoor playgrounds. 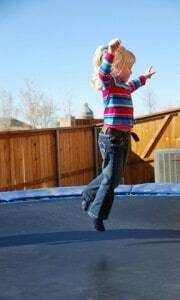 Thirty percent of trampoline injuries treated in hospitals are of fractures often requiring hospitalization. Spinal cord injuries and head trauma are not uncommon. When two people use the trampoline at the same time, the chances of injury go way up. When one child bounces, the other child becomes a projectile and can easily be catapulted off the trampoline. The lighter of the two children is 14 times as likely to be injured as the heavier one, because the heavier one delivers significantly more force to the platform. Proper installation of a trampoline involves placing the platform at ground level — for which, of course, you must have your landlord’s consent (it would involve digging a hole, which is an undisputed “alteration”). In light of these risks, your landlord has correctly identified your backyard trampoline as a “dangerous condition” on his property. He may be worried about his own liability should one of your children be hurt. It would take some cheek on your part, to be sure, but it’s not entirely inconceivable that you could file a claim against the landlord’s liability policy if your child is injured on the trampoline, asserting that the landlord bears some responsibility for the injury because he allowed the trampoline in the first place. And suppose a child from the neighborhood discovers the trampoline, uses it without adequate supervision, and gets hurt? Here, the landlord’s chances of being liable would go way up, because he might be seen as permitting an “attractive nuisance” — a dangerous condition, like an unfenced swimming pool, that is particularly likely to appeal to a child. In short, your landlord’s concerns are valid. Surely there’s a way that your kids can entertain themselves without putting themselves at such risk.